June has been a good month. I received my new business card designed by Bob Williams of Maginate Print Design Company and everyone has really liked it. Yes! The real card looks better than the picture above! I met a bunch of Military Aviators that were traveling through. Each one of them got a Badges & Boots tract and they thanked me for them. We did not get to talk much as they were loading up their vehicle and ready to fly out. Kim and I met a retired Air Force Sergeant. We spent about an hour talking to to him. He is a new Christian just getting into Church and we encouraged him to keep going. 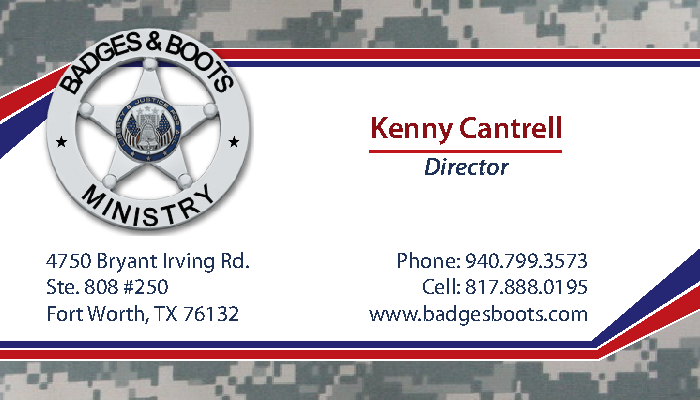 He was so excited about the Badges & Boots ministry, he just kept looking at the tract and saying, “This is so neat!” We left him with a business card to share with his son who is a S.W.A.T. member. We met another man who was wearing a ball cap with a Huey Helicopter on it. I asked him if he was an ol’ Huey Pilot and he replied that he did two tours in Nam as a Huey Pilot. We learned that he started out as an enlisted man, then he become a Warrant Officer and then he finally got his commission as an officer. Also in June our Spanish Badges & Boots tracts made it into Panama, Mexico and Puerto Rico. We are in the process of getting some made in a couple of other languages. We have also sent B&B tracts to several Army Chaplains and some military leaders in the States. ← Interjecting a Little Police Humor Here!